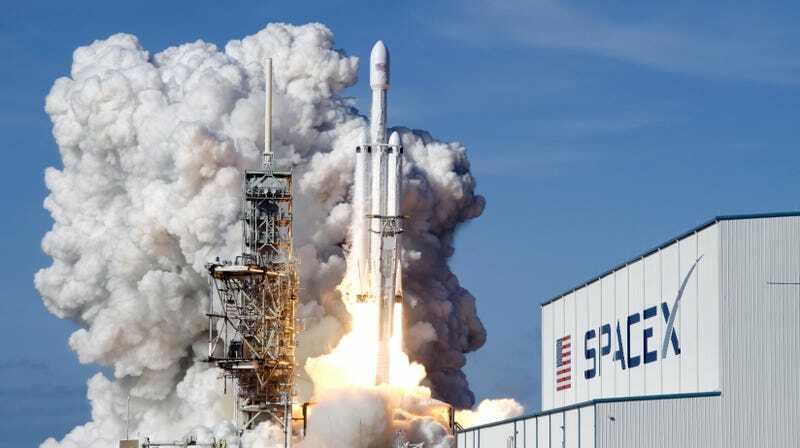 The inaugural launch of the SpaceX Falcon Heavy on February 6, 2018. Update on Thursday, April 11 at 4:15 p.m.: SpaceX will attempt the launch again this evening after Wednesday’s launch was scrubbed due to high winds. The live-stream embedded below will begin shortly before the new launch window opens at 6:35 p.m. ET. As noted in a SpaceX mission overview, today’s launch from the Kennedy Space Center in Florida is scheduled for 6:36 p.m. ET (3:36 p.m. PT), but with a generous launch window that will bleed over into tomorrow. Should the launch be scrubbed, SpaceX will try again tomorrow at the same time. The rocket was supposed to go up yesterday, but the launch was canceled due to high winds. This will be the first commercial mission for the Falcon Heavy. It’s delivering the 6-ton Arabsat-6A satellite to geostationary orbit some 36,000 kilometers (22,500 miles) above the Earth, the AFP reports. The Saudi telecommunications satellite will deliver “television, radio, Internet, and mobile communications to customers in the Middle East, Africa, and Europe,” according to SpaceX.